The night is heavy with anticipation. A sold out show at the Underworld Camden means absolute madness in most cases and this is no exception. 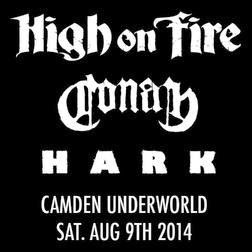 Stopping off in London for a special one off show, High On Fire take on one of Camden’s most intimate venues for an evening of audible delight and beer fuelled debauchery. Starting off the evening as it means to go on, Welsh sludgers HARK bought the noise as they powered through a heavy, technical set. Destructive vocals and powerful riffs were on the menu tonight, but unfortunately their sound may have been just too brutal for the venue as a bit of the technicality they manage so well on record was lost to the highly reflective Underworld. A fantastic performance with lots of energy however completely made up for this, as did their signing of a super sweet trans-orange 7" for me. Cheers lads, I’ll be sure to catch you again! Next up, the show was slowed down 300% as doom monoliths Conan took to the stage. Drawn out phrases of earth shattering distortion laid down by Liverpool's finest absolutely demolished my expectations (in a positive way). I found great pleasure in pressing my back up against the rear wall of the venue to feel the oscillating of those beautiful MATAMP's working, my whole body vibrating to the crazy thunder of guitar and bass. Conan have that beautiful quality of their name being an accurate description of their sound. Almost like an onomatopoeia, just saying their name conjures images of desolation and brutality, an perfect representation of their sound. After a short change over, finally Oakland’s premier power trio were on. At this point I had drank enough beer to sedate a rhino, while trying to stand on a practically broken ankle, so I couldn't go as mental as the music demanded of me. Rocking a sweet Lemmy style handlebar moustache, guitar legend Matt Pike announced the first song to an instantaneous explosion of energy. The crowd erupted into a frenzied mosh of bodies as the aptly named 'Fury Whip' whipped up a fury! This music just fills you with exuberance, every fibre of your being tingling with excitement and the need to move. Powering on, riff after riff, something occurred to me. This may just be an opinion but having seen Motorhead fairly recently, High On Fire really feel like what they could have been if they formed (nearly) 25 years later. It's the whole vibe of the music and the relentless rock and roll attitude, or maybe it was just the tache that made me think it! Their sound was great too, with great clarity and balance to the EQ. Songs like the closer 'Snakes For The Divine' where emotive journeys through metal making the camaraderie and kinship of music palpable as friends and strangers alike banded together for the love of one of metals finest bands. As the show drew to a close, the lack of encore left a slightly anti climactic feeling in the air, something that only another High on Fire show could cure! I can't wait until next time. Check the set list bellow and sound out about how jealous you are that you missed it! Thanks for reading Y'all!